Google Photos finds Lost Cat! Sue and her daughter, Shari, both have the latest and greatest smartphones – the Samsung Galaxy S6 Edge – and they love learning about them! They are members of the Quad Cities Computer Society in the Quad Cities area of Illinois/Iowa, and they took advantage of the Geeks on Tour presentations we gave there this past week. They attended 2 seminars and 2 hands-on classes. 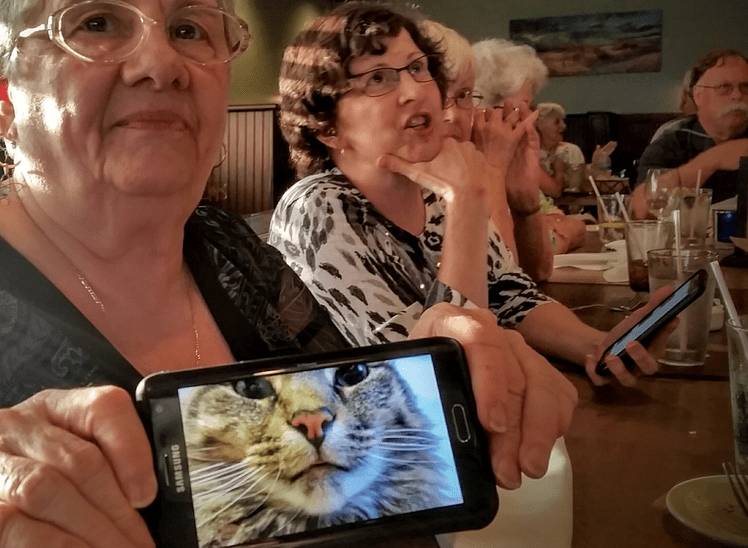 The club took us out to dinner at the beginning of the week, I sat next to Sue and she told me, “I want to show you this great picture of my cat, but I can’t find it.” I told her to open Google Photos, tap the blue magnifying glass in the lower right corner and type Cat in the search bar at top. Voila! There were all the pictures of her cat and she could easily find the one she was looking for! That IS a great picture of her cat, don’t you think? The cat is curled up safe at home, you did know I was talking about a picture right? Published by MrsGeek, in Blog. Tagged with #GeeksWhoTeach, #googlephotos, Android, Apps for Travelers, Droid, Geeks on Tour, Google Photos, iPad, iPhone, Quad Cities Computer Society, smartphone cameras, Smartphones, technology for photographers, Technology for Travelers.